TALENTED stayers High Opinion and Zero To Ten could not be separated for the Southern District Racing Association (SDRA) Horse of the Year title. High Opinion and Zero To Ten were locked together after the calculation of votes and shared the honour of 2015-16 SDRA Horse of the Year. 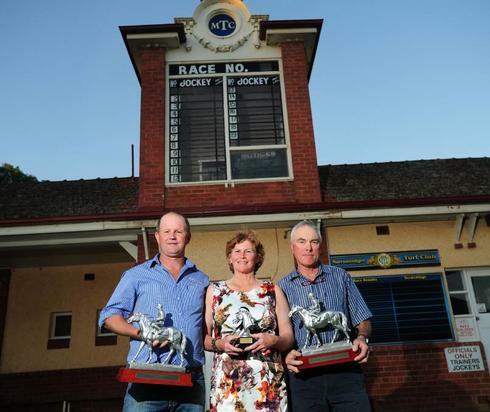 Wagga trainer Chris Heywood and Gundagai counterpart Jim Scobie were presented their trophies at the SDRA Awards night at Murrumbidgee Turf Club on Friday night. High Opinion was recognised for a top season where he ran second behind Tom Melbourne in the Albury Gold Cup and also claimed the MTC Country Cup. Zero To Ten was rewarded for a season where he won his hometown feature, the Snake Gully Cup, while he also claimed a heat of the SDRA Winter Series at Corowa. It was both Heywood and Scobie’s first time a horse of theirs had captured the coveted SDRA Horse of the Year title. “It’s great for the horse to be recognised given he’s been so consistent over a period of a couple of years,” Scobie said. “He took a while to mature, and he’s still got problems, but he’s my mate and we’ve got an agreement, he does what he likes and I do what I’m told. “Kathy and I have had so much fun with him. We’ve had six runs with him in Sydney, and even though he was possibly outclassed, he is just so consistent and has given us a lot of fun. Zero To Ten is owned by Scobie, Kathy Blay and Ben Blay and was a finalist for the award last year. High Opinion, owned by Craig and Sue Hardy, was trained by Heywood last season before being transferred to Kris Lees in recent times. Heywood was pleased to see High Opinion recognised. “He’s a lovely horse, this horse,” Heywood said. “The poor bugger, he did a tendon a couple of weeks ago and we’re all devastated, I know Craig is. “We probably didn’t see the best of him down here and Kris Lees was just trying to see the best of him and he came down. Corowa three-year-old Challenge Accepted won SDRA 3YO of the Year. Trainer Geoff Duryea declared Challenge Accepted’s next preparation will be make or break. “He’s in the paddock for a little while and will come back for the Country Championships at Albury. We’ve monitored him a bit so he’s eligible for that,” Duryea said. Mr Hummun Bee, trained by Trevor Sutherland, was named SDRA 2YO of the Year.